If you watched Black Swan and are feeling a little “heavy”, perhaps Your Highness will change your mood. Don’t get me wrong. Natalie Portman was beyond brilliant as the delusional ballerina. But, if you need some comic relief, this one should do it for you. Throughout history, tales of chivalry have burnished the legends of brave, handsome knights who rescue fair damsels, slay dragons and conquer evil. But behind many a hero is a good-for-nothing younger brother trying just to stay out of the way of those dragons, evil and trouble in general. 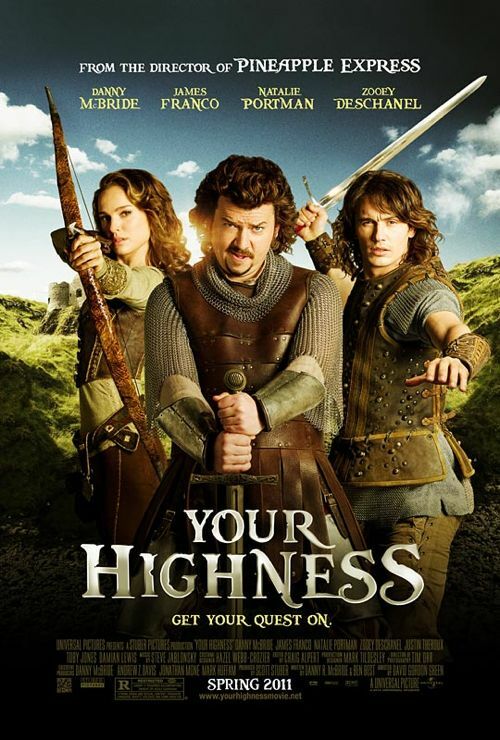 Danny McBride and James Franco team up for an epic comedy adventure set in a fantastical world–“Your Highness.” As two princes on a daring mission to save their land, they must rescue the heir apparent’s fiancée before their kingdom is destroyed.